Every August for the past several years, I have been invited to the virtual press conference for the release of the new Adobe Photoshop Elements program. I really look forward to this event but then I go a little crazy keeping it under wraps until the official release date because I'm always so excited to share the new features here! Today is the official release date for Adobe Photoshop Elements 2018. You might be asking what happened to 16 and 17 since we last left off on version 15? You aren't losing your mind (the jury is still out on mine though!) because Adobe decided to name each new version with the upcoming year. I think it's a smart approach because you will be able to tell at a glance how up to date or out of date your software is. My readers count on me each year to let them know what is new in each version and if it's worth upgrading. So let's dig right in! NEW Auto Curate—Your photos are automatically curated based on quality, faces, subjects, Smart Tags, and more, so you don’t have to search for the standouts. 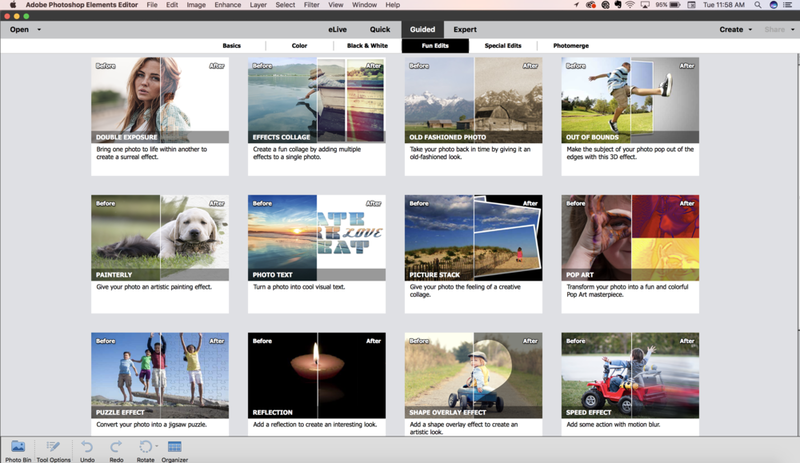 NEW Totally reimagined slideshows—Slideshows are a fun way to showcase your photo and video memories. With one click, they automatically pick your best photos and bring them together with short video clips to create a stylish, animated slideshow that you can easily customize with different photos and clips as well as great-looking themes. NEW Open closed eyes like magic—Did someone blink? Photoshop Elements automatically copies the open eyes from one photo and blends them into another to create the perfect shot. NEW Auto Selection—Making precise selections has never been easier—just drag and it’s done. NEW Replace backgrounds in seconds—Select the subject of a photo and place it on a background that’s more interesting. is Guided Edit makes it a snap. NEW Add artistic overlay effects—Embellish any photo with a shape overlay and one-click e ects that make it a work of art. is Guided Edit is great for scrapbook pages and photo cra s.
NEW Make amazing watercolors—Get help turning any photo into a beautiful, textured watercolor— and even nish it o with text. NEW Create double exposures—Bring one photo to life within another to create a surreal e ect. Photoshop Elements walks you through the steps. If your current version of PSE is 13 or lower, you should definitely upgrade as there have been many improvements made in the last few years. If your current software is PSE 14 or 15, you might want to try out the 30 day free trial to know if the upgrade is worth it for you. Those are my honest opinions. I'd love to hear if you are planning to upgrade or not and what your experiences are with this software. I'm a full-on PSE geek and true believer in this product! I use it for so many things like photo editing, digital scrapbooking, and even design work. I've used the full Photoshop program before and have found that I can do everything I want to in PSE and it's easier to use and less expensive. Win Win! If you are like me, you want to see what PSE 2018 looks like so I've taken several screen shots to share with you. I use a MacBook Pro but it should essentially look the same on a Windows computer. The biggest improvements are in the the guided edits for photo editing. 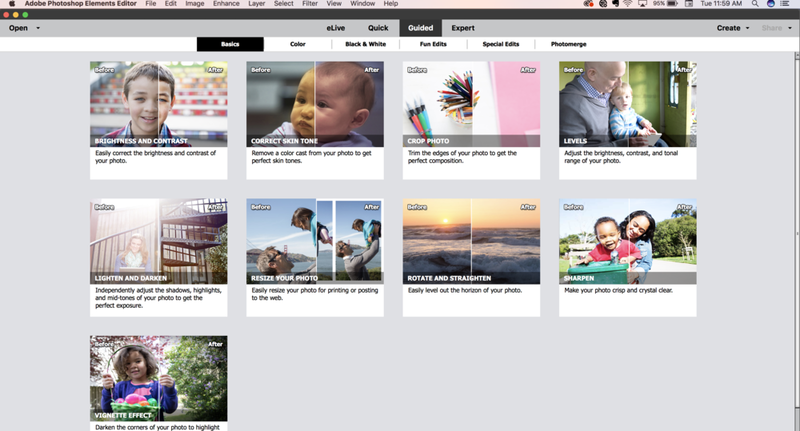 Here's a screen shot of the digital workspace in the expert area. This is where digital scrapbookers live! I opened up on of my layered templates from my Segments set and found that the workspace is essentially the same as it was in PSE 15. Adobe has done it again! Photoshop Elements 2018 is another great release and I'm excited to keep creating quick and beautiful photos, collages, and digital layouts with it!